At a campaign stop on Friday morning, Ontario Progressive Conservative Leader Tim Hudak pledged to cut 100,000 jobs from the public service in Ontario in order to balance the budget. To answer that question, first consider the size of the Ontario public service: The so-called “core public service” in Ontario employs approximately 60,000 people – these are the public servants who would work in the departmental structure and are likely what you think about when Hudak promises to ‘eliminate administrative positions’ – although many would work in front-line services, implementation or policy development. Including agencies, boards and commissions (such as Metrolinx, the Municipal Property Assessment Corporation, the Niagara Falls Bridge authority and several hundred other organizations) and provincial police and judicial employees, Statistics Canada numbers from 2012 place the number of Ontario public servants in the general government category as 88,483[i]. The OPP, which Hudak said he would not touch, consists of 9,000 of these positions. Hudak confirmed at his press conference that he would eliminate some of these agencies, including the Ontario Power Authority, Local Health Integration Networks and the College of Trades. Since Hudak says some of the job cuts would come from privatization, some of the 100,000 could come from the 39,712 people – including part-timers – employed by ‘government enterprises’ such as the LCBO, the OLG and provincial parks. Of course, many of these government enterprises are revenue-generating, so privatizing them might decrease government revenues more than they cut costs. Now here’s a scary number: If Hudak’s job cuts were to come entirely from eliminated “administrative positions” and privatization, it would represent a devastating 78% reduction in this pool of workers. The truth is that most public sector workers in Ontario work in the MUSH sector (Municipalities, Universities, Schools and Health). The health and social services sector in Ontario employs 238,555 people and, while Hudak said he wouldn’t cut “doctors [or] nurses” specifically, it is possible that some of the staff cuts would come from this sector. Indeed, in 2012, Hudak promised to close Ontario’s LHINs and Community Care Access Centres, which he estimated would cut 2,000 health administration positions. The postsecondary education sector and municipalities also employ a large number of Ontarians, but it’s likely that these areas would be harder for Hudak to cut. The government could starve funding to municipalities or universities, but it wouldn’t guarantee job cuts since they have independent budgeting processes and other non-provincial revenue streams. If Hudak’s cuts to the public service are going to come from core government, government enterprises as well as health and education sectors, then firing 100,000 workers would represent a 15.3% cut in these areas. Excluding “doctors, nurses or police officers” from this group, the cuts would represent 18.9% of the remaining public sector[i]. To put these promised cuts in perspective, according to a recent report by the Parliamentary Budget Officer, the total federal public service cuts since March 2010 have amounted to about 20,000 FTE positions, with an additional 8,900 positions scheduled to be eliminated by 2016-17. I’ll leave it to readers to determine if they think this a realistic promise, however, if such cuts were implemented it would be unrealistic to think services would be unaffected and it would ultimately mean 100,000 fewer good paying middle-class jobs in Ontario. And, with the economic multiplier effect, firing these public servants would decrease economic growth and hurt jobs in the private sector. [i] Statistics Canada, “Public sector employment”, CANSIM, table 183-0002. Average from January to March 2012. [ii] Paths to Prosperity: Preparing Students for the Challenges of the Twenty-First Century, Page 20. So much concern for the financial deficit – what about the deficit in human capital that is created by creating more poverty, lowering education quality, severing health services. We have barely recovered from the damage done by such policies 15 years ago under Mike Harris – and for all of their “business friendly policies” we still suffered the worst recession since the great depression while corporations squirreled away millions in off shore accounts – creating no jobs. This Hudak is a scarry man!!!!! Why doesnt he have all the politicians take a 20% cutback in pay and lose their allowances? We would vote for him if that were the case. No fear of that happening though. For the first time ever, I am voting NDP!!!!!!!! According to Stats Canada, there were 1,330,805 people in the public sector in Ontario. Of those, 181,000 are federal. This was as of 2012. I wouldn’t doubt if that number has grown also. So clearly there are more than 1 million public service people working in Ontario. There are also only 4.4 million private sector employees working. So that’s roughly 1 to 4 ratio. @Tim. In addition not all public service workers work for the Ontario Government. Several work for municipalities who will also be affected by cuts in the provincial government. They may also receive fewer transfer payments for infrastructure. You’re right that there are 1,330,805 public sector workers in Ontario as of 2010 (http://www.statcan.gc.ca/tables-tableaux/sum-som/l01/cst01/govt62d-eng.htm). Federal general government employment is 181,2721 and employment at federal government enterprises is 42,491 (who you forgot to count). Yes, that leaves 1,107K non-federal public employees in Ontario … but it isn’t reasonable to suggest that they all work for the Ontario government. For starters, 322,347 of them work for municipal government, local authorities and local government enterprises. Although municipalities get some provincial funding, a “premier Hudak” couldn’t directly order staff cuts at municipalities even if he impacted them with transfer cuts because they have other revenue streams and a large degree of autonomy. The same roughly goes for those working for Universities, who roughly employ 150K during the non-summer months. So, the 650K figure above is accurate … and, even that requires a definition of public service that includes workers in the medical and education sectors, which are the largest people on the Ontario government’s payroll (although indirectly). 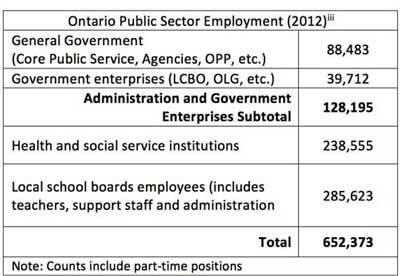 When most people hear “public service” or “administrative positions” they think of the people working in the Ontario Public Service in one of the departments, who only number about 60,000. The bottom line is that much of the messaging for this promise is misleading and the only way to cut 100,000 to cut into service areas like education and healthcare. There wouldn’t be enough “gravy” to trim from the central government. Why not create more jobs in the OPS to make a stronger Ontario and not worry about filling pockets of their buddies in the private sector? Pay the OPS employee their salary and benefits, versus adding a huge profit margin to that cost if that position were privatized. Good analysis, thanks for doing this work! The Liberals have done so much damage to our provence. It’s about time Tim Hudak straightens everything out again. We are in so much debt, that we have to sacrifice some to turn ourselves around. The Liberals are clowns with crowns and smiles on their faces. Tim means business. @Janet jGasparini Mike Harris was the best premiere ontario has known. When you say ‘the damage he did’ you are gravely mistaken. He did so much good for our provence. A minority conservative government seems to be the answer here with Hudak on a leash. Lets really put this put things in perspective here. You can barely make your mortgage payments because your boss has cut your hours back from 40 to 32 a week. The company you work for which is none unionized has cut back your wage from $25.00 an hour to $19.00 an hour saying you take the cut or loss your job so you took the cut. This is more or less what the Major Recession were in has done to the Province of Ontario. What saved Canada and Ontario was not cuts but the a major Housing Boom from Fred Mac and Fanny May who handed out thousands of mortgages to people who could not afford them in the 1990’s. Those same people defaulted on those mortgages and the crash hit in 2008. What this Province needs is an increase in its Revenues but with major manufactures shipping off all those good paying jobs to Mexico, China, and other third world countries where they pay $5.00 an hour to people who work ten hour days six days a week that is not going to be happening to soon. It has nothing to do with hydro raters that are too high, or tax rates that are too high. Mike Harris allowed the minimum wage to stagnate at $6.85 for eight years to appease his corporate backers. Meanwhile, they were doing everything in their power to strip people in this Province of any real jobs. During the Harris year plant after plant closed and jobs disappeared as he was cutting their corporate tax rates. Any government with any guts would tell all those companies who want to sell their wares in Canada that they need to build them here before they can sell it here. Because until all those good jobs come back it is only going to get much worse.